HONG KONG--(Marketwire - October 1, 2010) - Golf enthusiasts won't want to overlook the opportunity for fabulous 'Stay and Play' fun with a promotion offered by the Hong Kong SkyCity Marriott Hotel that combines relaxing amenities with a challenging round of golf on one of the city's most popular courses. A distinctive standout among Hong Kong 5 star hotels, guests will enjoy a long list of inclusive amenities and opulent accommodations when booking their Hong Kong visit and utilizing the 'Stay and Play' Golf package at the SkyCity Marriott. In addition to one night of deluxe accommodations, this unique package provides guests with complimentary transfer to and from Hong Kong International Airport/MTR Tung Chung Station, one 9-hole round of daytime golf for one at Nine Eagles Executive Golf Course, choice of a 60-minute Foot Reflex Massage or Foot Ritual at the hotel's remarkable Quan Spa, two complimentary Airport Express Line (AEL) train tickets and complimentary use of the hotel's onsite 27-meter indoor pool, Jacuzzi, steam room and sauna and 24-hour gymnasium. Designed to challenge players of all levels the meticulous Nine Eagles Executive Golf Course features a man-made lake and unique 'Island Green' at the edge of Lantau Island. Located adjacent to the Hong Kong SkyCity Marriott Hotel, the Nine Eagles course is designed with an environmentally friendly landscape of rolling terrain with billowing greens and extensive bunkering for a challenging Hong Kong golfing experience while staying at one of the finest of HKG hotels. Duffers will appreciate the golfing opportunity of this Lantau hotel's relaxing 'Stay and Play' Golf promotion allowing some holiday time while traveling for business or pleasure. Guests can enjoy magnificent views of the golf course or the South China Sea from the hotel's offering of spacious guest rooms and suites while other on-site amenities include the fabulous Quan Spa, where a full range of relaxing spa treatments are available; and restaurants showcase fine dining options with menus of American, International and Chinese cuisine. 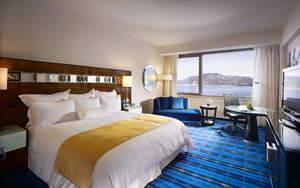 The Hong Kong SkyCity Marriott is one of the most sophisticated hotels in Hong Kong near Disneyland and is conveniently connected to the AsiaWorld-Expo, the city's world-class convention and exhibition center. With unsurpassed service and amenities perfect for business or pleasure, hotel guests will find themselves pampered with accommodations that include fine linens, plush robes and slippers, plug-in technology panels and high-speed Internet access. Our five-star hotel, located near the Hong Kong International Airport and area attractions, is connected to the AsiaWorld Expo.